How to get there: Onway to Ellora from Aurangabad, ask ur taxi driver to stop here. All local taxi drivers know this place. 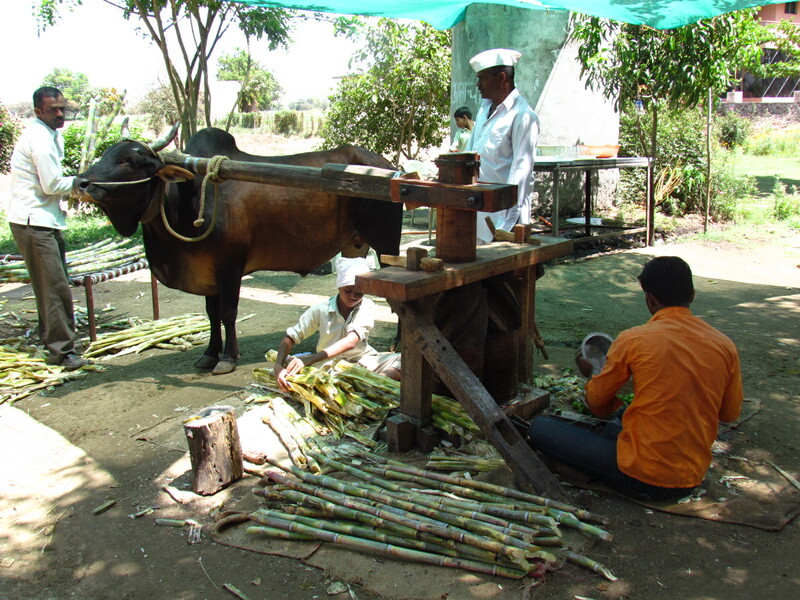 Sugarcane juice is sold all over India from hand carts that are fitted with metal crushers. These are usually always surrounded by flies & hygiene is a big issue. Nowadays large sweet shops like Bikanervala, Haldiram’s etc have started selling sugarcane juice from their shops & that is a good way to have hygienic sugarcane juice. Infact in these sweet shop chains, sugarcane is crushed with mint & ginger, thus infusing those flavors into the juice. However, these cost a lot – approx. Rs. 40 – 50 per 100 ml glass. In Bangalore I have seen shops that sell only Sugarcane juice – with different combinations – i.e. 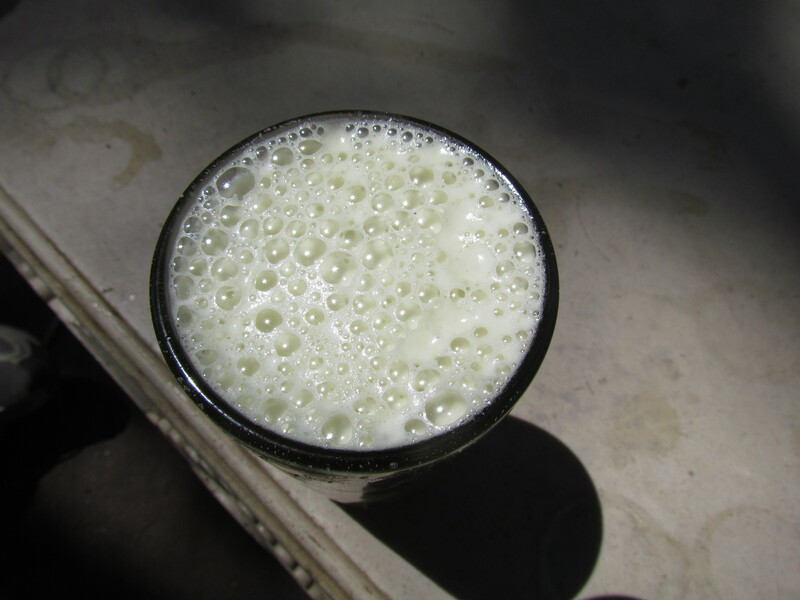 combination of sugarcane juice with other fruits – crushed together. The machines are automated & there is an element of modernity in those. The sugarcane was being crushed by the ancient method – A wooden plank is attached to the wooden crusher. Pls note wood is used instead of the metal that is used nowadays to make sugarcane crushers. In case of Kolu, a bull is tied to the wooden plank. So as the bull walks in circular motion, the crusher moves. 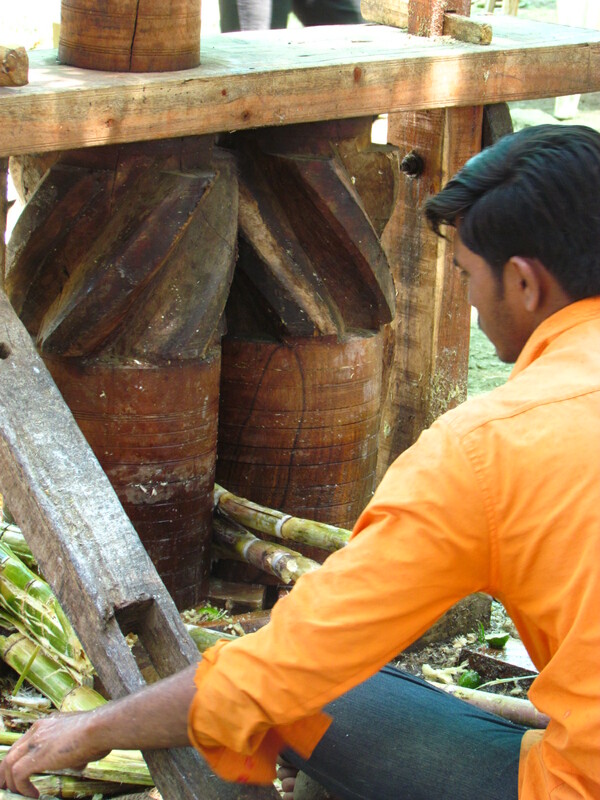 A guy sitting besides pushes the sugarcane into the crusher & the juice is collected at the bottom in metal containers. The result was a frothy thick sugarcane juice that was very tasty & refreshing. 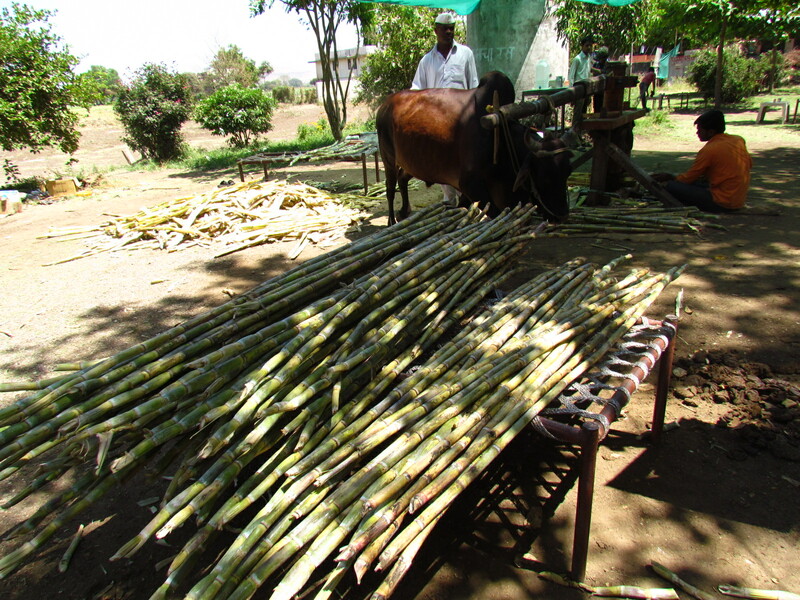 A part of the taste is also attributed to the use of thick sticks of sugarcane that is brought fresh from the adjoining fields. The best part of the deal was that each glass of 200 ml was being sold for Rs. 10 only!!!!!! ……………. & I finished two glasses at a go. 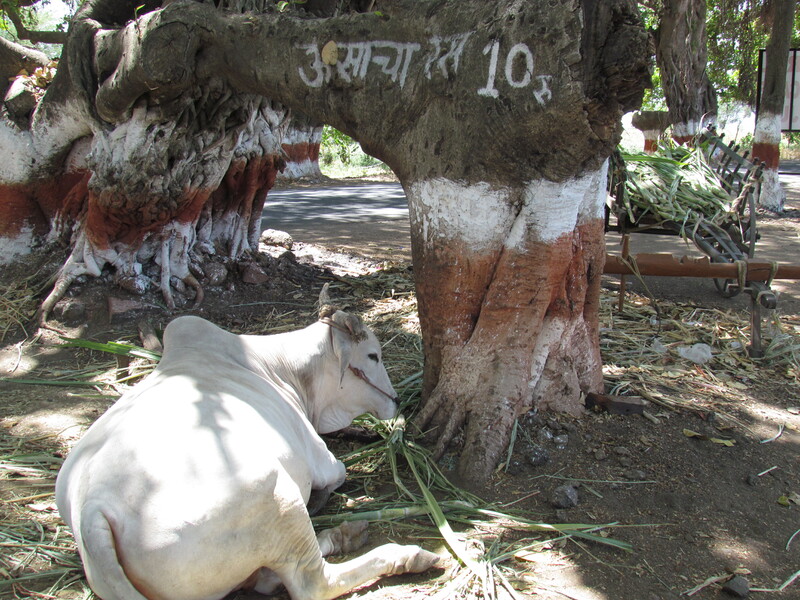 Rs 10 per glass – written in local language on an adjoining tree – The standby Bull resting below the same tree as well. 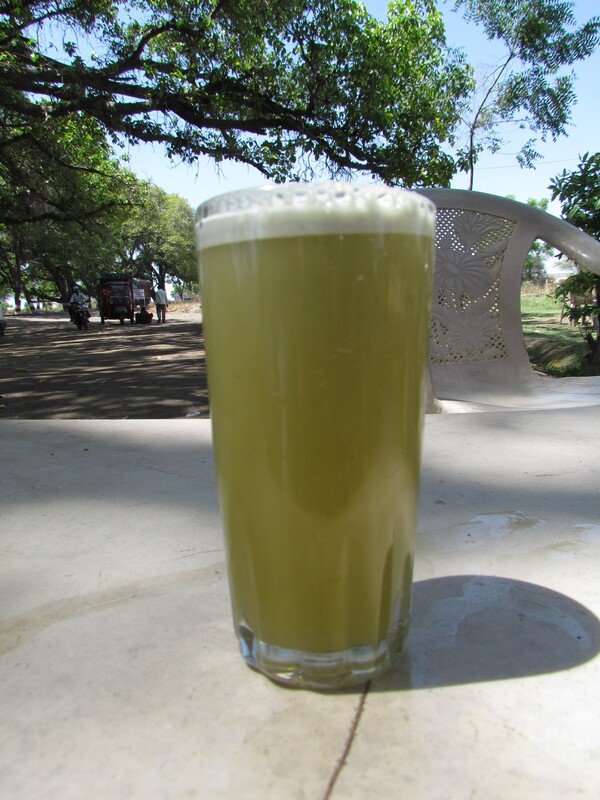 ganne ka raskolu ka baylSugarcane juicesugarcane juice extracted in kolusugarcane juice extracted the ancient way.